ATLANTA, Oct. 11, 2018 /PRNewswire/ -- ParkMobile, the leading provider of smart parking and mobility solutions in North America, announced today that the company will be the exclusive provider of parking reservations for First Energy Stadium, home of the Cleveland Browns. Fans are able to use the website, clevelandbrowns.parkmobile.io to easily find and reserve spots for gameday. The site allows a user to filter the available parking lots for specific needs like tailgating, oversized vehicles and more. Reservations can also be made using the ParkMobile app. ParkMobile gives Cleveland Browns fans a smarter way to park at FirstEnergy Stadium. With ParkMobile, you can easily reserve a parking spot before you head to the game. So you drive right to the lot and have a guaranteed spot waiting for you. You can make a reservation at clevelandbrowns.parkmobile.io or on the ParkMobile app. Easily reserve Browns gameday parking spots right in the ParkMobile app or on clevelandbrowns.parkmobile.io. Once you complete the reservation, you will get instructions on how to redeem parking at the stadium. ParkMobile provides similar parking programs for some the North America's most prestigious event venues like Mercedes-Benz Stadium in Atlanta, Soldier Field in Chicago, Prudential Center in Newark, T-Mobile Arena in Las Vegas, and Charlotte Motor Speedway. "We are excited about this partnership with the Browns that will make parking at First Energy Stadium much easier on gameday," said Jon Ziglar, CEO of ParkMobile. "The days of heading to the stadium without knowing where you're going to park are over. Now you make a parking reservation online and drive right to the lot where you have a guaranteed spot waiting for you." 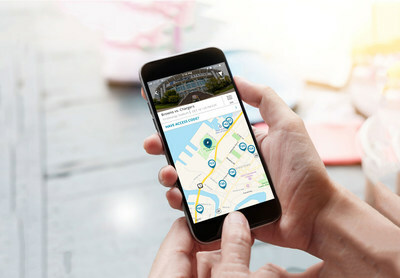 ParkMobile, LLC is the leading provider of smart parking and mobility solutions in North America, helping millions of people easily find and pay for parking on their mobile device. The company's technology is used in over 3,000 locations across the country, including 7 of the top 10 cities as well as college campuses, airports and stadiums. People can use ParkMobile solutions to quickly pay for on-street and garage parking without having to use a meter or kiosk. Additionally, ParkMobile offers parking reservations at stadium venues for concerts and sporting events. Reservations are also available in metro areas, allowing people to drive into the city without having to worry about finding parking. ParkMobile has been named to the Inc. 5000, Deloitte Fast 500, ACG Georgia Fast 40 and the Atlanta Business Chronicle's Pacesetter list. Additionally, the company won 2018 Stevie Awards for Most Innovative Tech Company and Best Integrated Mobile Experience. For more information, visit ParkMobile.io or @ParkMobile on Twitter.